When you are participating in or joining an activity and your participation has no significant impact or you don’t care about the outcome, then you can say you are in it “voor spek en bonen” (literally ‘for the bacon and the beans’). 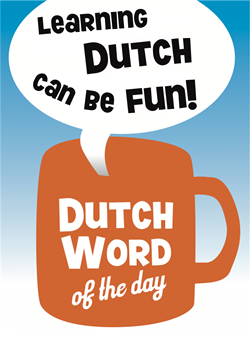 This phrase is typically used in conjunction with the verb “meedoen”: to participate. I heard this phrase yesterday when I was watching the popular Dutch reality show “Boer zoekt vrouw” (‘Farmer wants a wife’). Farmer Richard was supposed to choose from three women after spending some time with them on the farm. However, he had secretly met with one of them before their stay, thereby sealing the deal beforehand. The other women then complained that they had been part of the show “voor spek en bonen” only! You also frequently here “voor de show” (‘just for show’). – “Voor de show”: just for show. – Spek: pork, bacon [noun] [het spek]. – Boon: bean [noun] [de boon, de bonen]. – Show: show [noun] [de show, de shows]. This entry was posted in Dutch phrase of the week, DWOTD 1.0, Vocabulary Intermediate and tagged bonen, spek, voor de show, voor spek en bonen by Sander. Bookmark the permalink. Goede middag, Sander! I finally got the chance to listen to the radio broadcast from a few weeks ago. Heel leuk! Bedankte for making the time to do this. It is obviously a passion for you and the Gurus and this follower loves DWOTD! As a first generation Canadian of Dutch parents, my spoken and listening to Dutch is much better than my reading and writing. I have a Nederlands/Engels AND an Engels/Nederlands dictionary by my computer so I can spell the words I know how to say! Am coming to Den Haag in March! tot ziens van heel koud Ontario! Thank you for the wonderful website to learn Dutch by an interesting way.I just a beginner in Dutch learning.For a Chinese , Dutch is zo moeilijk >< especially I live in Friesland where people speak Fries in life.I learn a lot from your website.Dank je wel. Veel plezier in maart in Den Haag! Frysian is a language on its own so that is double the work for you! You might also want to tell something about the origin of this phrase.